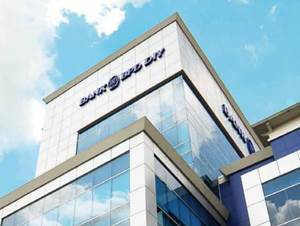 PT Bank Pembangunan Daerah Provinsi Daerah Istimewa Yogyakarta - BPD DIY or commonly abbreviated as Bank BPD DIY is a well-established regional government-owned company in Indonesia, running business in general banking industry. Bank BPD DIY is a regonal development bank of the Special Administrative Region of Yogyakarta (DIY) province. Bank BPD DIY is owned together by the provincial and municipal/regency goverments in DIY. At present, Bank BPD DIYS is 41.73% owned by the Provincial Government of DIY, 25.79% by the Regency Government of Sleman, 12.79% by the Regency Government of Bantul, 8.46% by the Regency Govenment of Gunungkidul, 6% by the Regional Government of Kulon Progo (6%), and 5.23% by the City Government of Yogyakarta. As of December 2015, Bank BPD DIY has 6 branches, 1 sharia branch office, 28 sub branches, 80 cash offices, 26 payment points, 6 mobile cash units, 31 sharia service units, and 99 ATMs. According to Bank BPD DIY Annual Report 2015 as cited by JobsCDC.com, PT Bank Pembangunan Daerah Provinsi Daerah Istimewa Yogyakarta posted an increase of 11.1% in total assets from Rp 7,821.59 billion in 2014 to Rp 8,689.88 billion in 2015. Total operating profit amounted to Rp 256.98 billion in 2015, which represented an increase of 14% over total operating profit recorded in 2014 of Rp 225.10 billion. Male / Female, single/not married and willing not to get married for one year. Maximum age 27 years old on 31 October 2016. Minimum S1 from Computer Science or Informatics Engineering with a minimum final GPA of 3.00 on a 4.00 grade scale. Expertise with programming language, minimum Delphi/ C++/Java/PHP/ Microsoft.Net. Expertise with database programming Oracle/SQL Server. Minimum D3 from any fields, except: Health Sciences / Nursing, Literature & Humanities, Arts, Education, Religious, and Tourism. Minimum final GPA of 3.00 on a 4.00 grade scale. Male , single/not married and willing not to get married for one year. Have driving license class C (SIM C). Able to work with target system. JobsCDC.com now available on android device. Download now on Google Play here. Please be aware of recruitment fraud. The entire stage of this selection process is free of charge. PT Bank BPD DIY - D3, S1 Fresh Graduate Officer, Micro Credit Analyst, Programmer BPD DIY November 2016 will never ask for fees or upfront payments for any purposes during the recruitment process such as transportation and accommodation.